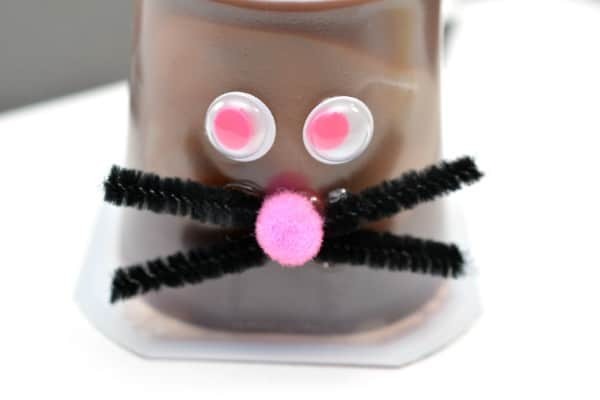 This Black Cat Pudding Cup is a fun Halloween treat, but also a creative dessert for your child any time of year. It’s an incredibly easy way to brighten your child’s day. Why Make a Black Cat Pudding Cup? My kids are gone for 8 hours each day between the bus ride to and from school in addition to the school day. That doesn’t include before or after school activities that they sometimes attend. That’s a long time between our morning “I love you, have a good day” to the afternoon/evening “Welcome home, I missed you” moments. 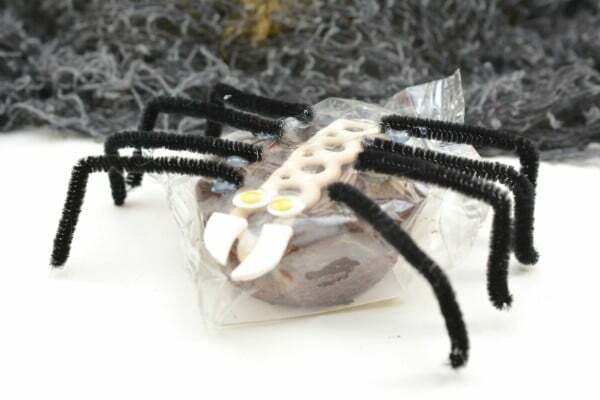 Sometimes I like to hide something in their lunchboxes or backpacks to surprise them during their school day. For my teens, I’ll simply text them a gif or short note. For younger kids, lunchbox notes are super easy to slide into lunchboxes. When you have a few extra minutes, snack crafts are even more fun for kids. 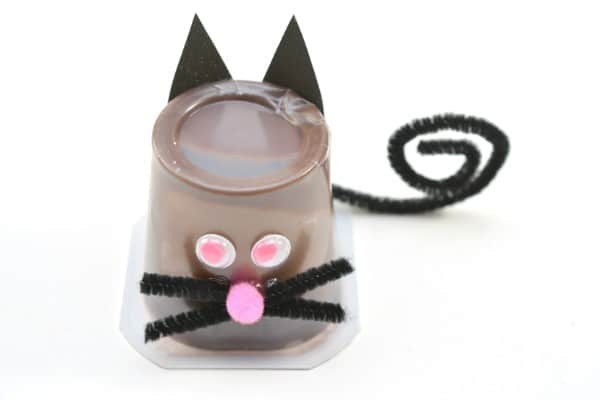 This Black Cat Pudding Cup is a great snack craft for Halloween season. First of all, it’s chocolate pudding which is sure to make most kids happy. Second, it’s an adorable cat! 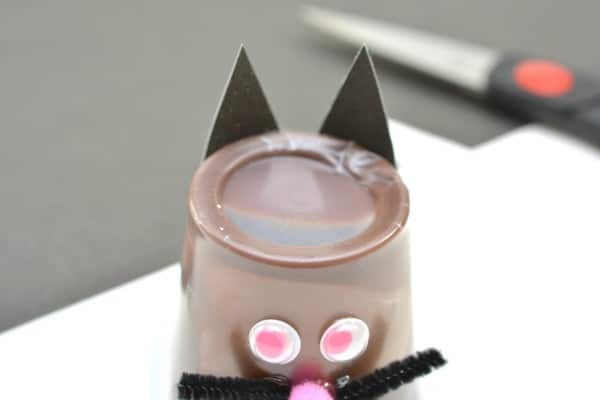 This Black Cat Pudding Cat is really simple to make using just a few basic craft supplies. If you don’t have a craft supply stash, don’t worry. I have snack craft ideas for Easter, Thanksgiving, and Christmas. You’ll get plenty of use out of the items on the list below throughout the year. First, place the pudding cup upside down so that the bottom is pointing up. 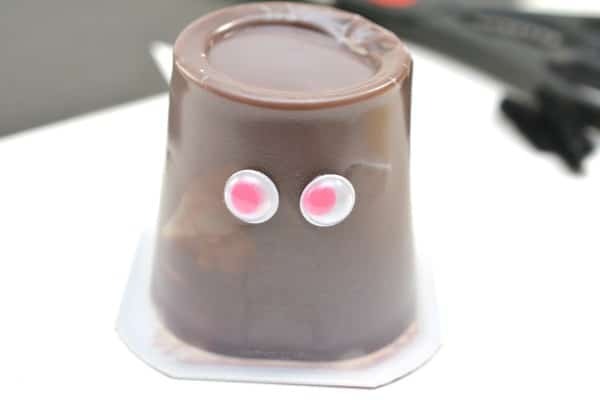 Glue two googly eyes to the front of the upside-down pudding cup. 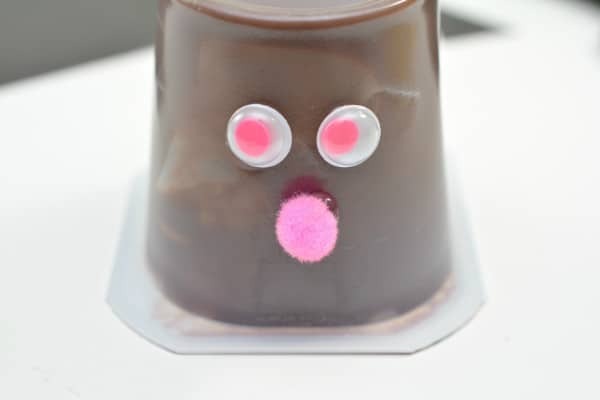 Use the glue gun to apply a small craft pom pom to the center of the front of the pudding cup under the googly eyes. This will be the nose of your cat. 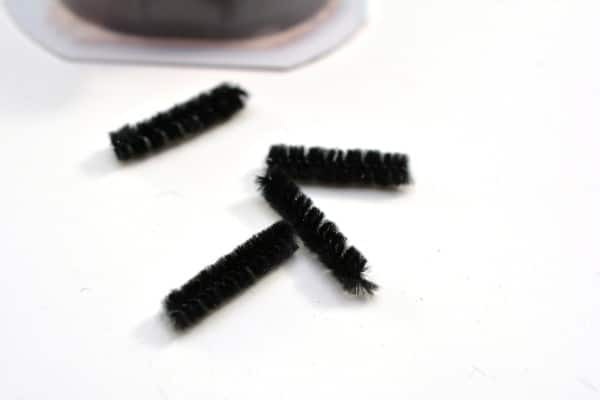 Cut out four small pieces from the black pipe cleaner, about an inch in length. Glue the four pieces of pipe cleaner around the nose of your cat, two on each side to serve as its whiskers. Cut out two triangle shapes from some black cardstock. 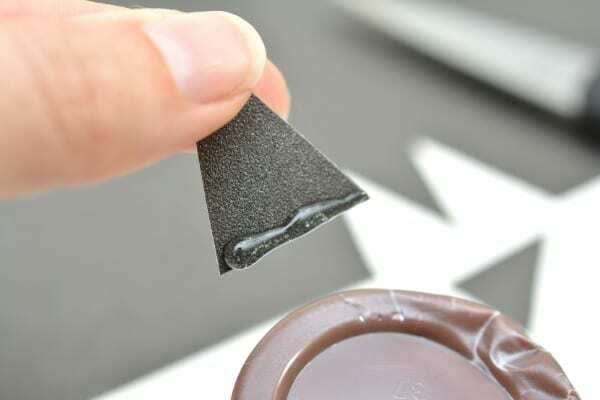 Attach the two triangles to the back of the pudding cup for the cat’s ears. 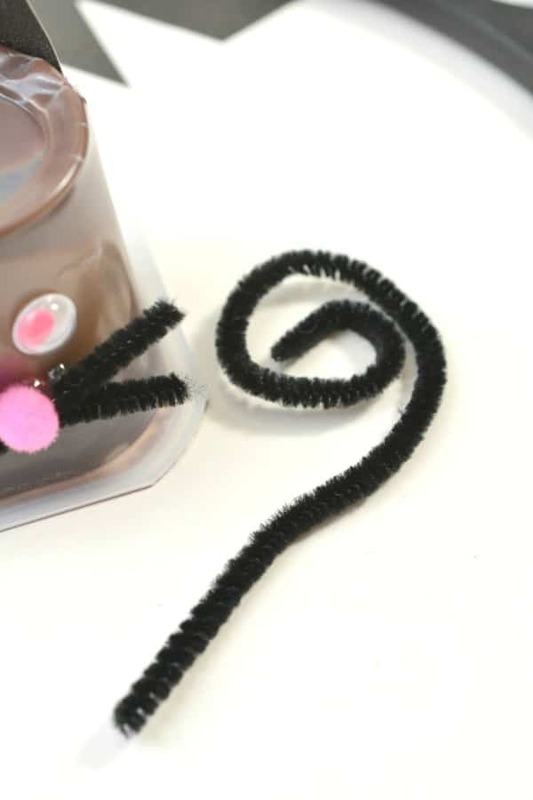 Take the remainder of the black pipe cleaner, and curl it up into a spiral shape. Leave a bit of the pipe cleaner straight on the end. 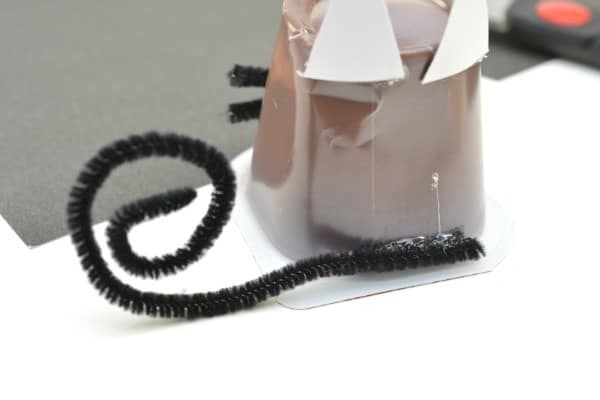 Glue the spiral pipe cleaner to the bottom of the back of the pudding cup. This will be the cat’s tail. That’s it! Your black cat pudding cup is ready for the lunchbox! 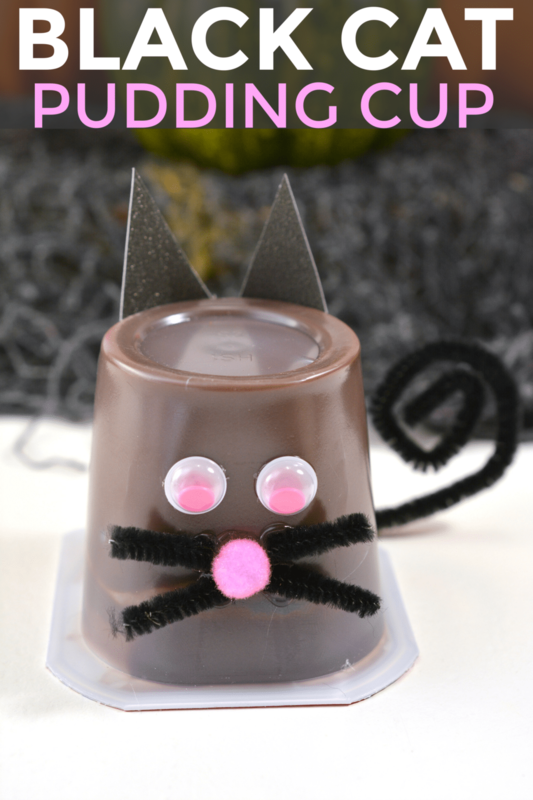 If you liked this black cat pudding cup, you might enjoy some of my other fun Halloween ideas. 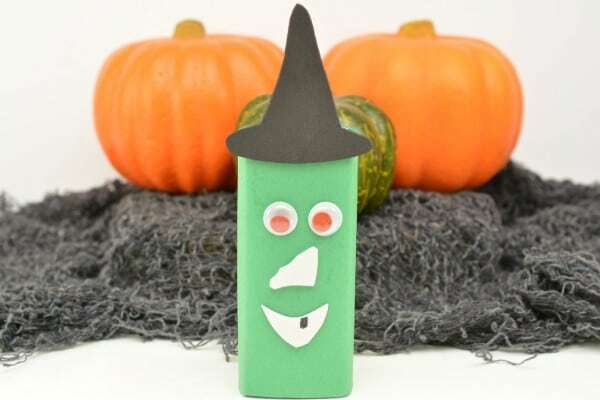 Find this craft along with 11 other great projects in my Easy Halloween Crafts e-Book!